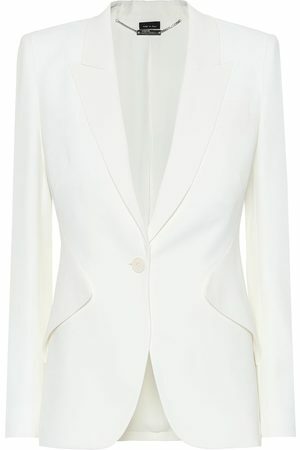 Alexander McQueen's impeccable tailoring seems magnified when it's combined with a military influence. Made in Italy, this black blazer is sharply cut from wool-crepe with red leather piping at the high collar and buttoned epaulettes. The peplum is structured to snake around your hips before falling to a longer back hem. Wear yours with silver jewelry to match the embossed buttons.